When I was in my teens my mom encouraged me to start a hope chest. She explained that she and her mother and so on down the line had them. That it was something young ladies did back then, so that when they entered marriage they brought something with them. Course back in her day and before most girls didn't leave home until their wedding day. So I did what she suggested, I believe my sister did, too. Every pay day I'd buy one or two things. And by the time I moved out on my own I had all the kitchen and bath items that I would need for my apartment. I left home when I was seventeen and didn't get married until I was eighteen. 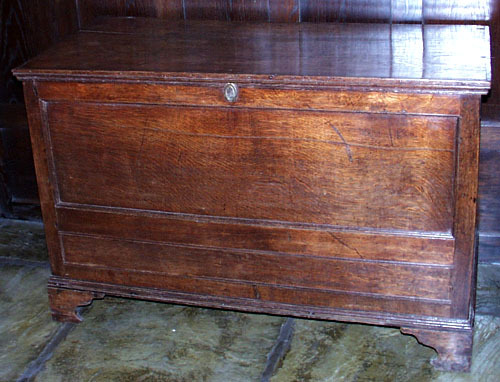 Anyway, the chest in this picture is very similar to the one I have. I was looking at it the other day, thinking about what was inside it, when I thought about my granddaughter, Alivia. How cool would it be to do the same thing with her. Course she's too young now, but maybe when she's around fifteen. I already have some beautiful quilts my mother made, and dish clothes she knitted, to go into it. Did any of you have a hope chest? That's what I use mine for now, Carin. When Alivia gets old enough I'll probably buy her a chest of her own. I remember it was fun buying stuff for it.